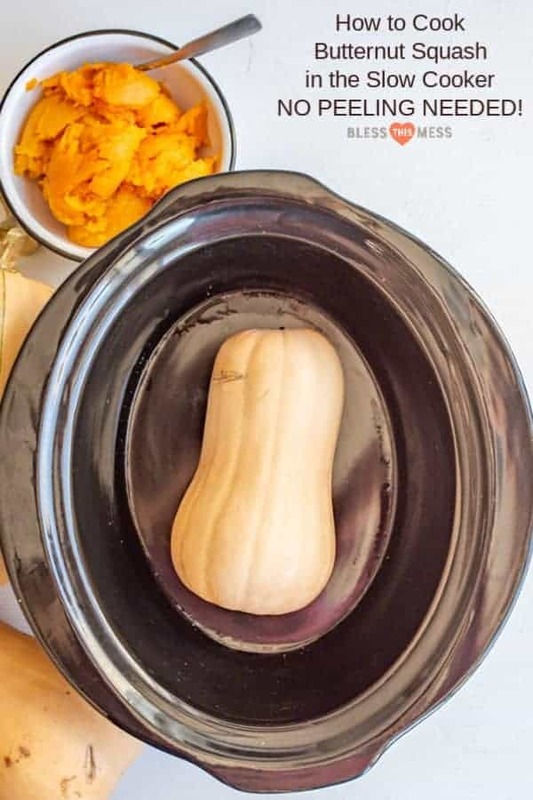 Have you ever wondered how to cook a whole butternut squash in the slow cooker? This is by far the easiest way to cook butternut squash! No need to peel or remove the seeds before cooking. Wanting to cook a whole butternut squash? Well I’m here to tell you that the slow cooker is the easiest way to cook a whole butternut squash, seeds, skin, and all! What I love about cooking squash in the slow cooker is that it’s super hands off, you don’t have to peel, cut, or remove the seeds first, and the squash comes out super silky smooth and ready to eat or use in other recipes. It literally couldn’t be easier. How do you use butternut squash cooked in the slow cooker? I love butternut squash cooked like this and I’ll often slice the cooked squash in half, remove the seeds, then add a pat of butter in each hollow where the seeds where. I’ll add a sprinkle of salt and pepper or salt and cinnamon to the cut sides of the squash and serve the halves right in the skin. We pass the plate and scoop out the squash we like and spoon a little of the melted butter over our portion. I also like to treat the cooked squash like you would mashed potatoes and whip it up well with butter, warm milk, and salt. Mashed butternut squash is delicious. 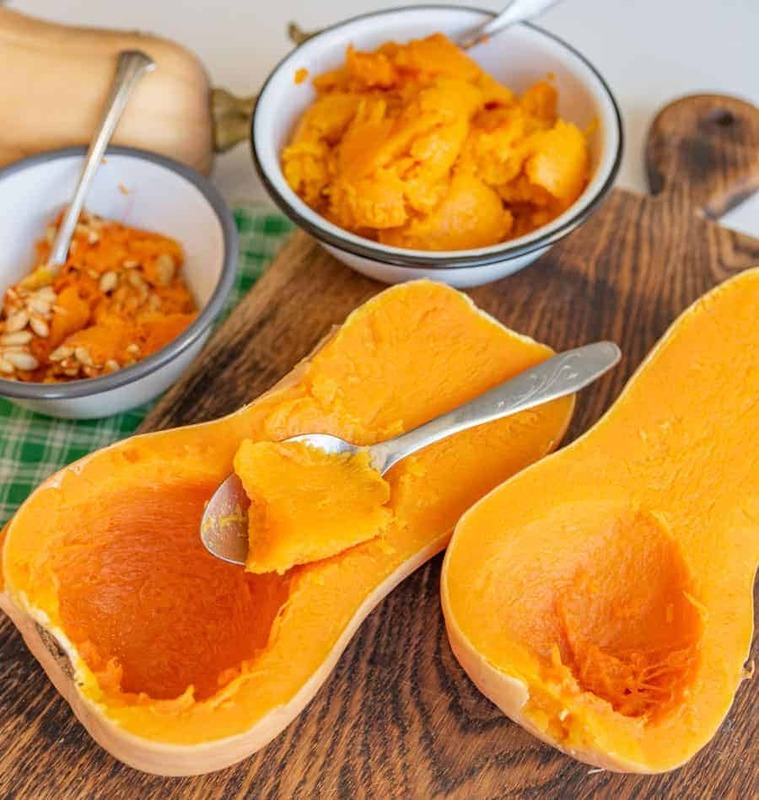 I also like to use it like you would pumpkin puree, potatoes, or sweet potatoes (it makes a great topping for Shepherd’s Pie, and you can add smashed squash to your favorite pumpkin waffle recipe in place of the pumpkin). 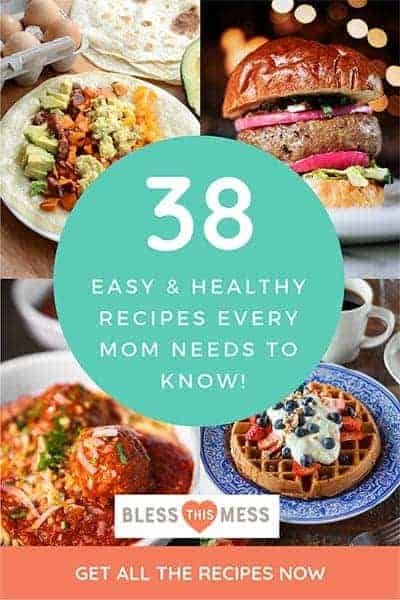 You can also use it in your favorite chili recipes! I love pureed squash in our favorite Instant Pot Vegetarian Chili. So many options! 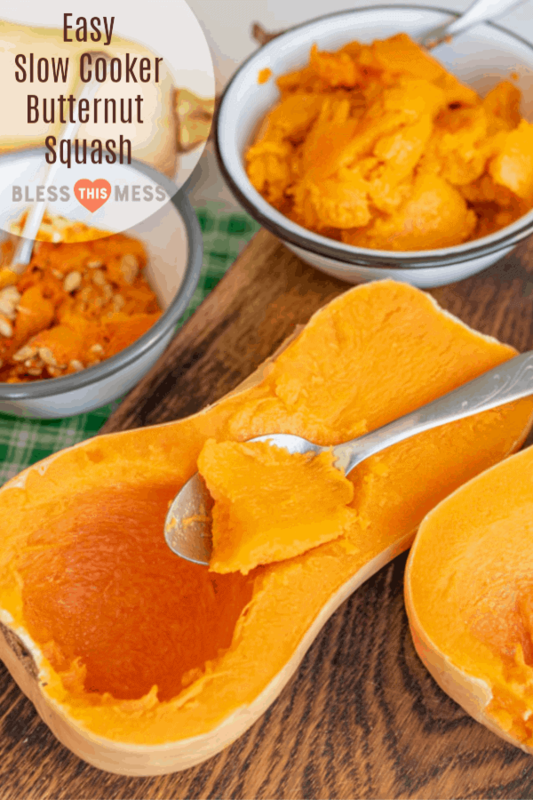 When buying butternut squash, be sure to get squash that are firm and blemish-free (no nicks or bruises). It’ll store a few weeks (even months) so feel free to stock up when they go on sale and are in season (late summer-fall). All you need to do is wash off the outside of the squash! No messing with a knife, no need to cut in half – I didn’t even add water to my slow cooker. Just toss it in, set it, and walk away. 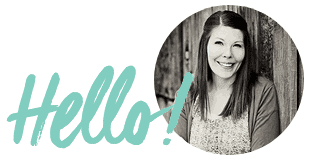 I have this simple Hamilton Beach slow cooker and I love it (the lid clamps on and that’s awesome, especially if you take things places like soup to church functions!). If you are in the market, it’s a good one. 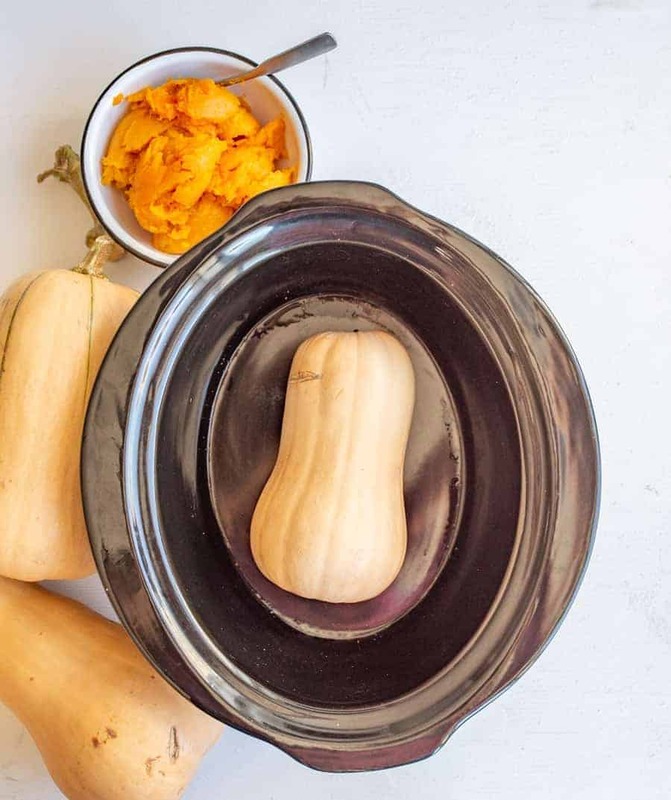 How to cook a whole butternut squash in the slow cooker – the easiest way to cook one! No need to peel or remove the seeds before cooking. Prepare you squash by washing off the outside well and breaking of the stem (if you can – the stem isn’t really going to hurt anything). No need to prick the outside, but you can if you like. 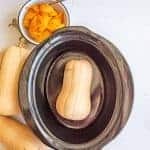 Place the squash in the bottom of the slow cooker. No water needed. Cover and cook on low for 6-8 hours or on high for 4-5 hours. Test the doneness of the squash by poking it with a fork. If the fork pierces the butternut squash easily then it’s done. Let the squash cool enough to be handled. Remove from the slow cooker and place on a cutting board. Cut the squash in half from stem top to blossom end. Use a spoon to remove the seeds and discard (or feed to your chickens or roast them up like you do pumpkin seeds). Use a spoon to scoop out the soft flesh and use as you like or eat it as is with a little salt, pepper, and butter. Seriously, next time you have a butternut squash to cook, don’t even mess with peeling it and trying to cut it! I’m here to convert you to the ease and deliciousness that using your slow cooker brings. Do it! Enjoy from my kitchen to yours. will it work if you lower the temperature to as low as 118F/ 47C ? I think it sure would, it just might take a really long time, like up to 12 hours. You’ll have to play with it and report back!